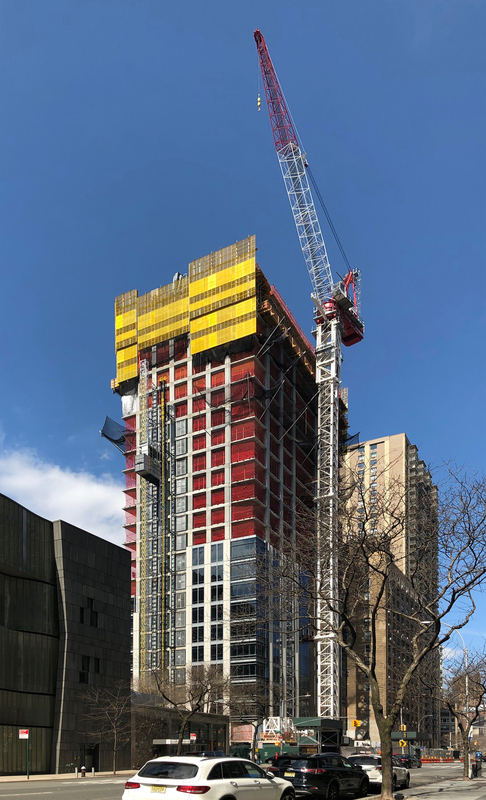 Construction at 200 Amsterdam Avenue is quickly rising above the surrounding rooftops. 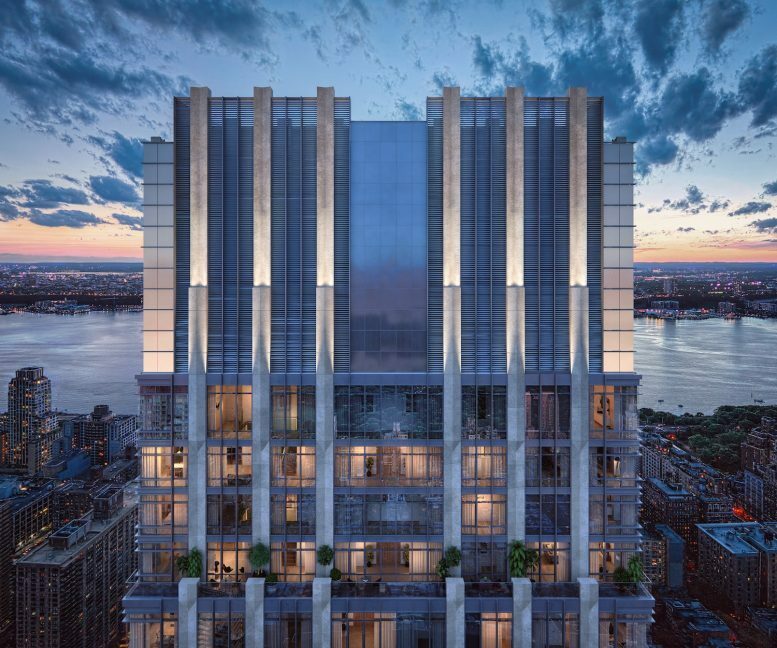 When topped out, the 668-foot-tall residential development will hold the title of tallest skyscraper on the Upper West Side until Extell‘s 775-foot tall tower at 50 West 66th Street tops out. The building is designed by Elkus Manfredi Architects, which was responsible for The Shops & Restaurants at Hudson Yards. SJP Properties is the developer while CetraRuddy is the lead interior designer. The 283,000-square-foot project, which sits at the southwestern corner of Amsterdam Avenue and West 70th Street, will yield 112 residential units. Work is presently reaching a couple of mechanical floors. This section of the building is where the first of seven setbacks on the eastern elevation begins. 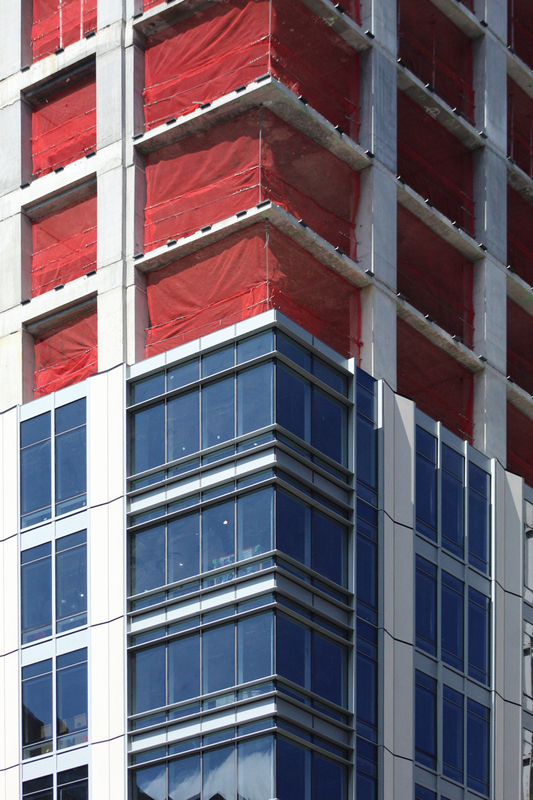 The curtain wall, which features a mix of glass, glazed aluminum panels, composite masonry, and stainless steel accents is also rising at a brisk pace. The podium will have double-height squared arches that are made with grey limestone, black granite, and stainless steel components. 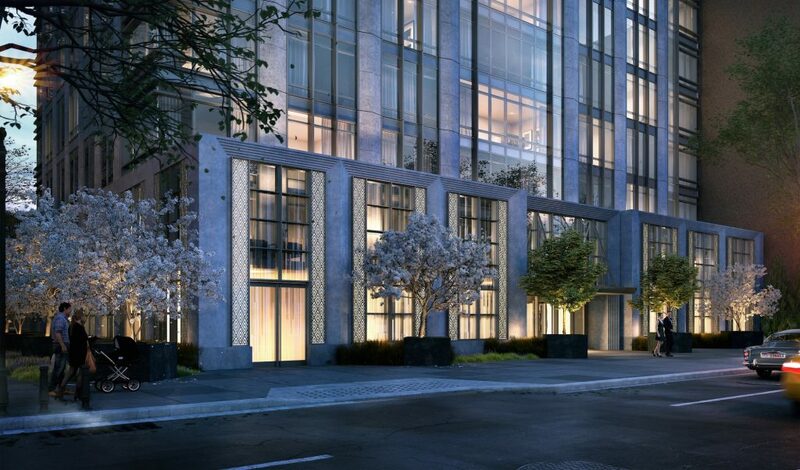 The height of the crown will be accentuated and visually integrated with the rest of the building by the number of thin panel strips between the glass windows. They will extend beyond the residential floors and continue up all sides of the tower’s stepped profile. Floodlights will shine upward on the indented crown panels and give off different plays of light, shadow, and depth. Two duplex penthouses will occupy the top four floors and provide the best views of Central Park, the Midtown skyline, the George Washington Bridge, and the Hudson River. Each setback will feature a landscaped outdoor terrace, accessible by certain units. Other amenities will include an indoor swimming pool, a fitness center with a yoga space, a sauna room, a conservatory, a virtual golf room, a children’s playroom, and a residential lounge. The site sits among a number of old and new apartment buildings. These include Handel Architect’s 20-story, 236-unit diagrid tower at 170 Amsterdam Avenue, which is less than 200 feet away to the south. The closest subways are the 1, 2, and 3 train at the 72nd Street station at Broadway. The B and C trains are also not far away at the 72nd Street station on Central Park West. Riverside Park is about a ten-minute walk to the west. 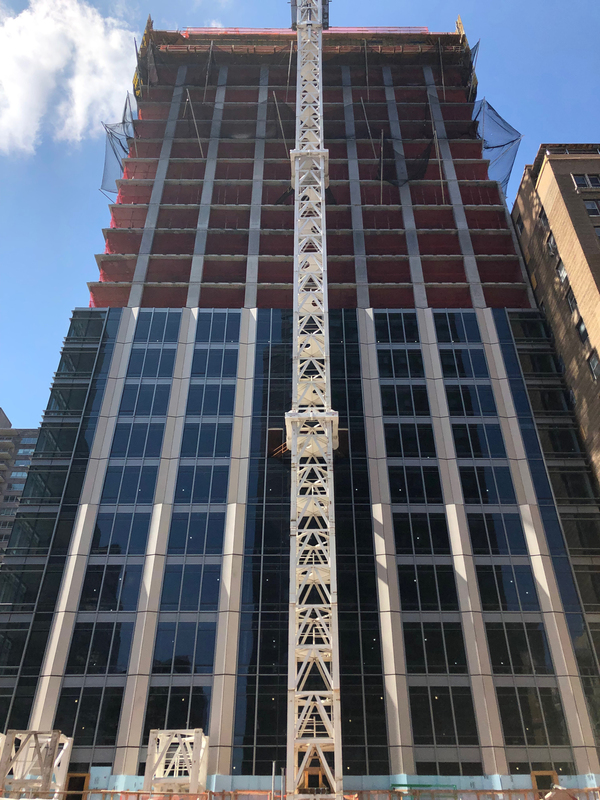 200 Amsterdam Avenue is estimated to be completed sometime in 2020. 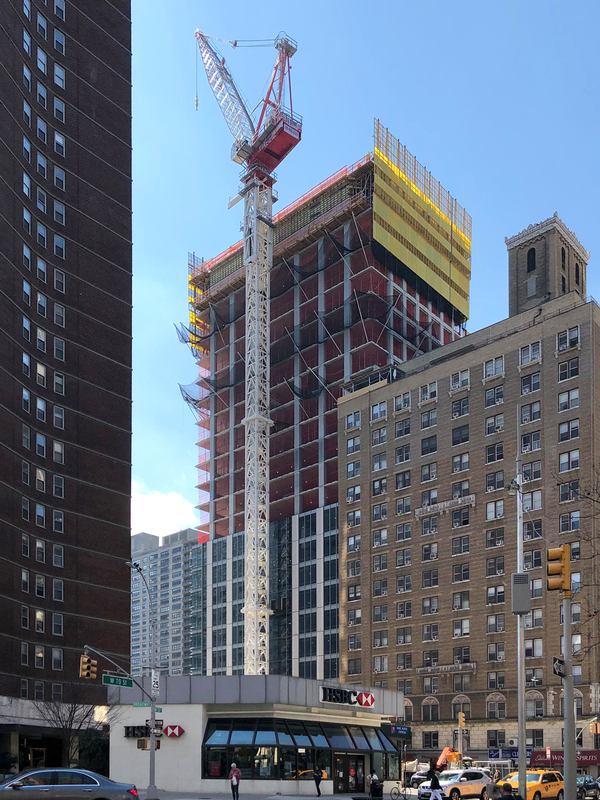 15 Comments on "The Upper West Side’s New Tallest Tower Begins Gaining Prominence, at 200 Amsterdam Avenue"
Lol not even a quick mention in this post of the court ruling against the project, YIMBY’s not in denial, no sir. what fee did SJP Properties pay you to write this story? this article is advertising in the guise of a blog. how sad. This looks to be a really great building. It’s top is tops! Don’t you just love how the people who don’t like development comes to NY YIMBY to coomplain that they are too pro-development. Hello? It’s NY YIMBY, not NY NIMBY. There are plenty of NIMBY blogs and publications out there, why focus your hate on one that is not? I’m not down with the NIMBYs, but the complete lack of any mention of the ongoing drama around this development or 50W 66th is either blatantly cynical or just plain bad journalism. But then I’m not sure what I expected from a blog that mostly regurgitates developers’ marketing materials. @antinimby don’t confuse hate with constructive criticism. as skyscraper fans I think we can expect better than this thoughtless drivel. 95% of the buildings in NYC built since after WWII are worst than this tower. How come you aren’t out there complaining on those drivels? Yeah, you are a NIMBY. I’m not against the idea of a tall building at this location but this is one ugly building. Really. It is hardly any worst than most of the modern buildings that go up in NYC. However, it seems to get more hate from the NIMBYs than usual. Yeah, I think the fact that it is tall and in the NIMBYl-land of the UWS has something to do with it. Sorry, but compared to what’s been getting built in the last 10 years or so, this one’s ugly as all getout. What happens to these already built 30 floors if the permits are revoked? The permits have not been revoked and that’s what the NIMBY’s loudmouth rep i.e. Gale Brewer is protesting about. However, to answer your hypothetical question, if somehow the permit is in error (which it is not likely to be since it has been examined and re-examined many times) then the developer just needs to remedy whatever it is that it is not in compliance with. What happens? This is America. The developer ends up paying a fine – just enough to demonstrate that the elected officials are doing their jobs but not so much as to be crippling to the developer. And so it goes. The cost of doing business.